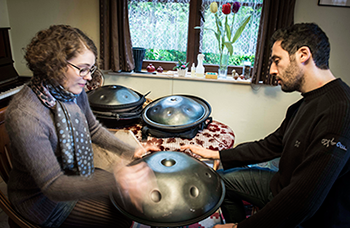 DO YOU WANT TO DISCOVER THE HANG/HANDPAN AND LEARN HOW TO PLAY? The course can be offered one to one or in a small group of up to 4 participants. The 1 to 1 discovery workshop lasts 3 hours, and costs €110. It is usually at my place in Uccle (Brussels), or I can come at yours for an additional €0.35/km. You can also create a group of 2, 3 or max 4 participants if you wish. 2 participants: 4 hours, €150. 3 participants: 4 to 5 hours, €180. 4 participants: 4 to 5 hours, €200. 2) You already have an instrument: I accompany you to discover its full potential, improve your playing and liberate your creative and expressive skills through fun and rhythmical exercises. The course is offered one to one. We organize this at my home – or I can come to yours.